1. TO PROMOTE A JUST AND LASTING PEACE IN IRELAND. 2, TO CONVINCE PEOPLE THAT THE BRITISH PRESENCE IN IRELAND IS THE ROOT CAUSE OF OUR SOCIAL AND ECONOMIC ILLS. 3. TO SECURE BRITISH WITHDRAWAL BY NON-VIOLENT MEANS. The IIP case is that while the British remain there can be no solution. There is general agreement among Non-Unionists that the British presence Is the primary cause of our problem. It is therefore illogical and dangerously misleading to say that the Britith must stay to solve the problem and then leave. How can it make sense to ask those who are the cause of the problem to stay to resolve the problem ? We are the only Party which is facing up to the reality of our problem and demanding a British withdrawal within a set period of time. The extension of the Agricultural Grant for Disadvantaged Areas. A single Green Pound for the whole of Ireland. 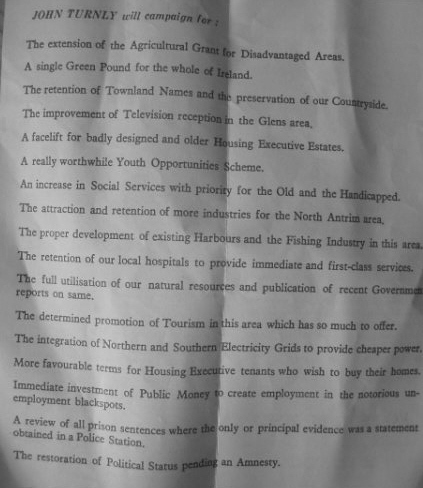 The retention of Townland Names and the preservation of our Countryside. The improvement of Television reception in the Glens area. A really worthwhile Youth Opportunities Scheme. An increase in Social Services with priority for the Old and the Handicapped. The attraction and retention of more industries foe the North Antrim area. The retention of our local hospitals to provide immediate and first-class services. The full utilisation of our natural resources and publication of recent Government reports on the same. The determined promotion of Tourism his area which has so much to offer. The integration of Northern and Southern Electricity Grids to provide cheaper Power. More favourable terms for Housing Executive tenants who wish to buy their home. Immediate investment of public money in create employment in the notorious un-employment blackspots. A review of all Prison sentences where the only or principal evidence we a statement obtained at a Police Station. The restoration of Political status pending an Amnesty.